Vegetable spiralizer. Veggie spiralizer. Veggie spirals. Vegetable spiral. Just a few years ago, these words would not be found together. Now, of course, spiral cutters are popular and that means all these words can be found all jumbled together — kinda like a pile of veggie noodles on your plate. 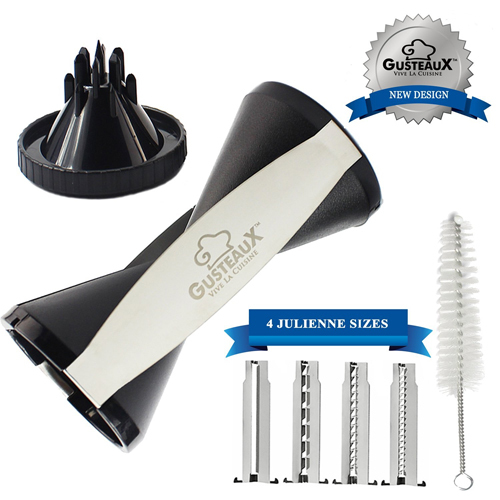 The Gusteaux Quadghetti 4-blade Spiralizer is a new, affordable spiral slicer that comes with four different blades (3mm, 5mm, 10mm and 70 mm). Capable of making spiral cuts on a variety of different vegetables, the kitchen gadget makes it easy to put a new twist on otherwise ordinary meals. And if a new spin on food isn’t enough of a mouthful, saying ‘Gusteaux Quadghetti Spiralizer’ 3 times fast (well, better make that 4) certainly is. Got a nose? Have a face? Use your mouth? Well, then. You are in luck! 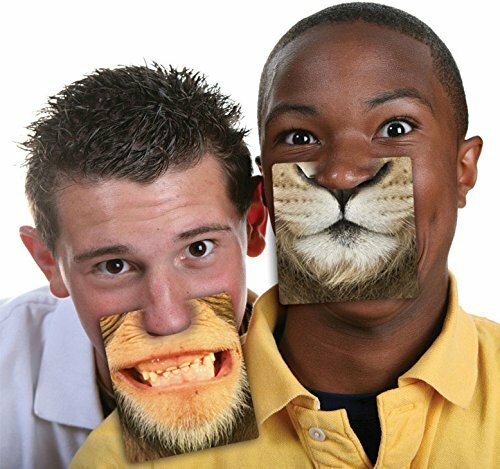 These Party Animal Face Coasters will liven up the party indoors and out. Perhaps taking their design cue from people holding LP record covers over their faces, the drink coasters hold one major advantage over that activity, namely, being able to see while holding the thing up to your face. Taking a swig from the beverage however, might get a bit messy. But that’s okay, you animal! Comedy and hamburgers just go together. Wait. No they don’t. Burgers are serious business. Just ask Wimpy and his perpetual need to pay you Tuesday for a hamburger today (assuming it is not actually Tuesday, of course). When it is burger time, it is burger time; no fooling around. 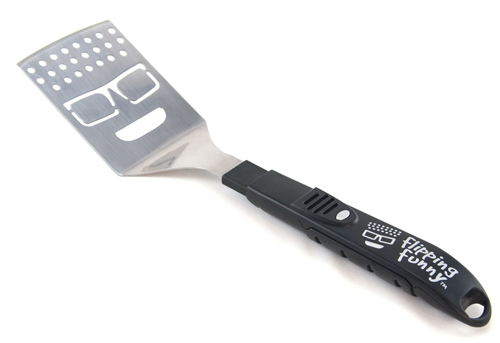 Unless, of course, you have the Flipping Funny Talking BBQ Spatula by Charcoal Companion . The silly contraption is designed to add a little whimsy at the grill and wise-cracks “9 hilarious phrases” at the press of a button. Looking as much like Drew Carey as a spatula possibly could, the novelty grill accessory is sure to be a hit at the next cookout — if not because of the hilarity, then because it is serving up burgers. 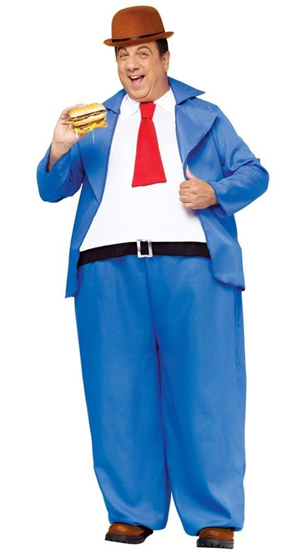 Wimpy would be impressed. Stickers are handy little things when it comes to organization. Just write what you are storing on one and stick it on the thing you’re storing it in. But then there is no turning back (only adding additional stickers). Items in the kitchen lack permanence (thankfully). As we eat our way through the pantry and food cabinet, the jars and storage containers have their contents reduced until the label is staring back at us with empty, cold indifference. Incorrectly as well. How rude. 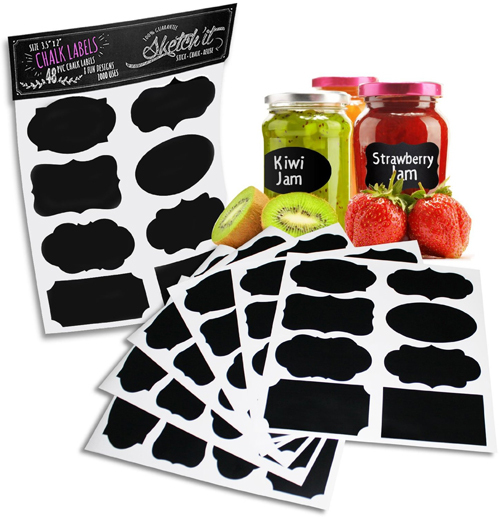 The Chalkboard Labels Sticker Set looks to politely erase that mistake by allowing actual erasing. Consisting of a variety of styles at an affordable price, the reusable stickers can be written on with chalk over and over again. With 48 stickers in the pack, there are enough to get organized in every room of the house. Maybe teach those plain ol’ traditional stickers some manners as well. Tea is (often) caffeinated. Owl are nocturnal. Coincidence? 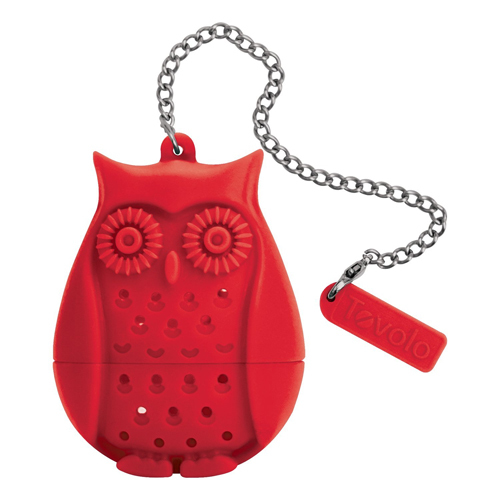 Clearly the Tovolo Owl Tea Infuser doesn’t think so. The little guy is made of silicone and holds loose leaf tea and can be filled easily via its removable base. Other tea infusers in the set include a pig, a sheep, an anchor and a gingerbread man. Now what they have to do with drinking tea is anybody’s guess. Perhaps it is only the owl who knows. Nothing says ‘I love you’ quite like a sharp cutting implement. Relationships require trust, right? Like, perhaps, the trust to order the pizza with the correct toppings. (Or, more importantly the trust to not order the pizza with the incorrect toppings, because anchovies do not equal love.) Knowing this, pizza places long ago came up with the idea of half-toppings. Really, just think how many relationships were saved with the concept. Yes, everybody can be happy. Now, if it’s a frozen pizza that’s another story… and it will need a pizza cutter regardless of what the toppings are. 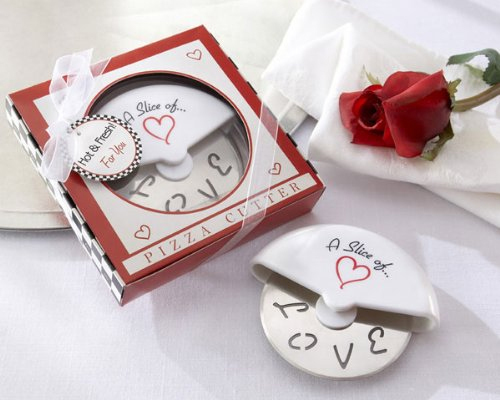 One way to accomplish the pizza cutting is with the sharp Love Pizza Cutter that promises pizza to be a ‘slice of love.’ If you are picking up one for your honey on Valentine’s Day, you’ll need a pizza to go with it. Have a romantic night in and pick up a pie, making sure, of course, to get the correct toppings! Let’s keep that ‘slice of love’ confined to the pizza.